M R Trabue, Bessie Bacon Goodrich. LANGUAGE ARTS FOR BOYS AND GIRLS 5 Teachers Copy. We can help you find the regional & ethnic cooking books you are looking for. As the world's largest independent marketplace for new, used and rare books, you always get the best in service and value when you buy from Biblio.com, and all of your purchases are backed by our return guarantee. ZCook Books Health: Hastings House Book Publishers, 1992. 259 pps., Over 250 low fat, low cholesterol, low salt, low sugar recipes. As seen on PBS TV. Hard Cover. Very Good/Very Good. 8vo - over 7¾" - 9¾" tall. ZCook Books American: Workman Publishing Company, 1982. 362 pgs., Illustrated. Cover has light wear and page edges have some soil.. Soft Cover. Good. Illus. by Sheila Lukins. 8vo - over 7¾" - 9¾" tall. Minnetonka, Minnesota: Cooking Club Of America. Fine with No Dust Jacket as issued. 1999. Special Edition. Hard Cover. 1581590474 . 000967: No Jacket as Issued. Scarce, Out Of Print, Book. Beautiful photographs of dishes and preparation steps throughout. "The Master Recipes are designed to be your keys to even better cooking, allowing you to utilize a wide range of essential cooking skills. You'll find secrets to making an omelet truly fluffy and a creamy soup wonderfully smooth, roasting a chicken to perfection, baking the perfect apple pie and more." If interested, I have several other volumes in this Cooking Club Of America Series. : Photographs: 8.75 x 11 in. : 168 pages . ZCook Books American: Coward-McCann, Inc., 1963. 302 pgs., Has very light wear to cover and spine is ready to crack at center. No jacket.. Hard Cover. Good/No Jacket. 8vo - over 7¾" - 9¾" tall. ZCook Books American: Clarkson N. Potter, Inc., 1989. 202 pgs., photos. Hard Cover. Very Good/Very Good. 4to - over 9¾" - 12" tall. Partners Real Estate Co.. Fine. 1970. Revised Edition. Soft Cover. 002235: Tight binding, unread condition. Undated volume; believe was published about 1970. 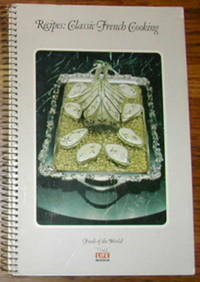 Contains recipes including those of the President and Vice President of the United States, over 50 U. S. Senators (including S. I. Hayakawa's Sukiyaki Cacciatore, Strom Thurmond's Pecan Pie, and Adlai Stevenson's Brunswick Stew), recipes of other famous personalities, such as Roger Staubach's Beef Stroganoff, Princess Grace's Farcis, and Barbara Walter's Stuffed Cabbage Rolls, as well as dozens of other recipes, each credited with the name of its contributor. Scarce, Out Of Print, Book. : 5.5 x 8.25 in. : 112 pages . ZCook Books American, 1976. 322 ppgs., Title page is present but pulled out. . Binder. Very Good Minus. 8vo - over 7¾" - 9¾" tall. Doubleday & Company. Fine in Fine Dust Jacket. 1992. First Edition: First Printing. Hard Cover. 0385424043 . 000004: Dustjacket now protected by a new Brodart Mylar Cover. An international collection of recipes, food lore, facts, and tips from one of the world's best-known TV chefs. Includes more than 200 recipes. Pages 244 & 246 have slight wrinkle at top. Scarce, Out Of Print, Book. "Served up with easygoing style and garnished with piquant wit, this is a banquet of food lore, history, and travel tips - plus more than 100 four-star recipes from famous restaurants all over America and around the world. ": 9.5 x 8.25 in. : 324 pages . ZCook Books French: Time Life Books, 1968. 208 pgs., photos & illustrations, Illustrated cover. Slightest cover wear.. Hard Cover. Very Good/None Issued. 4to - over 9¾" - 12" tall. Richmond, Virginia: Colonial Williamsburg Foundation. Fine with no Dust Jacket. 1979. Hard Cover. 0910412308 . 004005: "Accomplish'd Gentlewoman's Companion: Being a Collection of Upwards of Five Hundred of the Most Ancient & Approv'd Recipes in Virginia Cookery. " Boards are orange patterned paper with a black cloth spine. Scarce, Out Of Print, Book. : 4.25 x 7 in. : 276 pages . Emmaus, Pennsylvania: Rodale Press. Fine in Fine Dust Jacket. 1998. First Printing. Hard Cover. 0875964400 . 004689: Dustjacket now protected by a new Brodart Mylar Cover. "This cookbook takes the mystique out of French cooking. The recipes are classic French dishes that have been streamlined to be health, simple, and easy to prepare. Using the trade secrets of these talented chefs, home cooks will be able to easily recreate stunning and flavorful modern French dishes, such as: Chocolate Soufflés, Wine-Steamed Salmon, Lamb Chops with Spring Vegetables, Mango Tarte Tatin, Potato-Mushroom Galettes, Chicken Breasts Chasseur, and Lobster Salad. Forty seasonal dinner menus use the freshest, healthiest, most flavorful ingredients for a distinctly French taste. " Scarce, Out Of Print, Book. : 7.75 x 9.5 in. : 314 pages . ZCook Books Mexican: Gallery Books, 1987. 80 pgs., Photos. Last end page has been removed. Appears to have been uncirculated.. Hard Cover. Good/Good. Folio - over 12" - 15" tall. Ex-Library. London: Victor Gollancz Ltd, 1953. First Edition. Hardcover. Blue boards. Good, in good dust wrapper. 155 pages. 19 x 12.5 cm. A profusion of recipes from Britain's prolific food writer. From soups to savories, Heath does not disappoint. Dust wrapper rubbed with 1 cm. loss to back cover. Interior toned. ZCook Books International: Edison Electric Institute, 1958. 48 pgs., Illustrated. Stated 1st printing . Slightest soil. Corner crease to rear cover.. Pictorial Wraps. Very Good. 8vo - over 7¾" - 9¾" tall. ZCook Books Mexican: Chronicle Books, 1996. 131 pgs., Photos. Soft Cover. Very Good. 8vo - over 7¾" - 9¾" tall. ZCook Books Of The Orient: Gallery Books, 1990. 240 pgs., photos. Massive volume. 14 X 10. Hard Cover. Very Good/Very Good. Folio - over 12" - 15" tall. ZCook Books Of The Orient: Octopus Books, 1974. 144 pgs., photos. Light edge curl to dust jacket.. Hard Cover. Very Good/Very Good. 4to - over 9¾" - 12" tall. ZCook Books Cooking Wine: W. & R. Chambers Ltd., 1973. 208 pgs., Photos & illustrations. Jacket has a sticker blemish to the front and light wear.. Hard Cover. Very Good/Good. 8vo - over 7¾" - 9¾" tall. ZCook Books American: Yankee Books, 1990. 202 pgs., Some wear to the cover.. Soft Cover. Very Good Minus. 4to - over 9¾" - 12" tall. ZCook Books American: Harper & Row, Publishers, Inc., 1981. 84 pgs., illustrations. Jacket has small edge tears and is price clipped. Sticker removal blemish.. Hard Cover. Very Good/Good. Illus. by Dale Glasser. 8vo - over 7¾" - 9¾" tall. Milwaukee, Wisconsin: Ideals Publishing. Fine. 1975. First Printing. Soft Cover. 001118: Stated First Printing. "Whatever menu you are planning, we believe that you'll find something you need in this cookbook: it could be a complete Oriental meal, or a Scandinavian smorgasbord ... Maybe just a recipe or two from some country that you want to add to your menu for that special touch ... Or it might be a dinner with recipes from many countries ... Or a meal to remind your family and guests of their own special ancestry. " Scarce, Out Of Print, Book. : 8.5 x 10.75 in. : 64 pages . ZCook Books International: Gramercy Publishing Inc., 1964. 280 pgs., Dust Jacket has large folded tear on rear.. Hard Cover. Very Good/Good Minus. Orlando, Florida: Advance Publishers. Fine. 1985. First Edition. Soft Cover. 011072: "New England Originals * Colonial Cooking * Pennsylvania-Dutch Treats * Southern Savor * San Francisco Delights * Hawaiian Treats * Old Southwest Favorites * Shaker Cooking." Covers and pages are clean, unmarked, brightly colored, tightly bound and sharp cornered. Scarce, Out Of Print, Book. If interested, I have several others in this McCall's New Cookbook Collection Series also available. : Vol. 22: Photographs: 8 x 10 in. : 64 pages . ZCook Books Of The Orient: H.P. Books, 1985. 287 pgs., photos. Dust jacket has light curl to edges and wear.. Hard Cover. Very Good/Very Good Minus. 4to - over 9¾" - 12" tall. Milwaukee, Wisconsin: Wisconsin Gas Company. Fine. 1970. First Edition. Soft Cover. 009811: Scarce, Out Of Print, Book. 1970 Edition. Covers and pages are clean, tightly bound and unmarked. Book has red/orange colorized drawing of lobster, mushrooms and several bottles on front cover. Content Chapters include: Fondue, Melons, Before and After Measurements, Herbs and Spices, Meat Carving, Sausages, Appetizers and Beverages, Soups and Sauces, Main Dishes, Salads, Salad Greens, Vegetables, Breads, Sweets, What Happened To My Cake?, and an Index. : 7 x 9 in. : 64 pages .